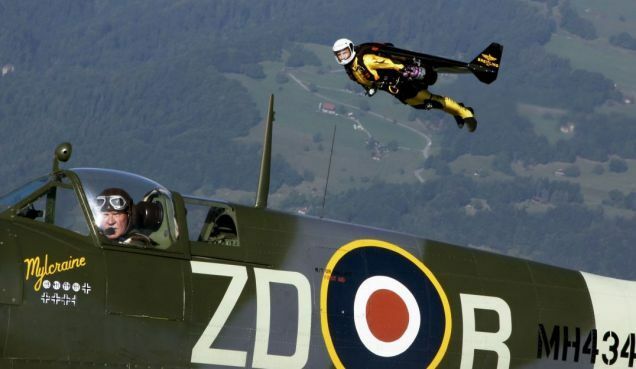 The Spitfire, based at Duxford in Cambridgeshire, was piloted by fellow Breitling Flyer Nigel Lamb from Britain. 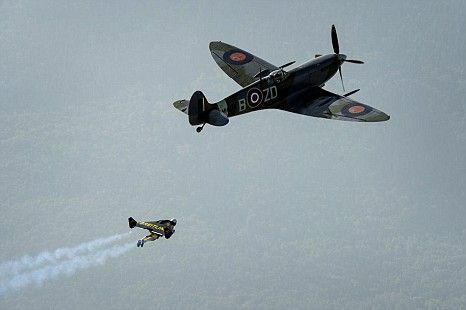 The aviators met in the skies above Bex, near Geneva, Switzerland, as part of a celebration of the history of aviation. Built during World War II, the Spitfire gives a more comfortable, and much longer ride. The Jetwing can stay up for only 13 minutes. ‘To fly in formation with this wonderful machine (the Spitfire) is an incredible experience,' said Rossy, 53, an ex-fighter pilot. ‘Since my technology is getting more and more reliable I am very confident about these flights. I can relax and enjoy such a fantastic experience. Reg Mitch would be proud!!! Ha ha ha, how cool!!! !